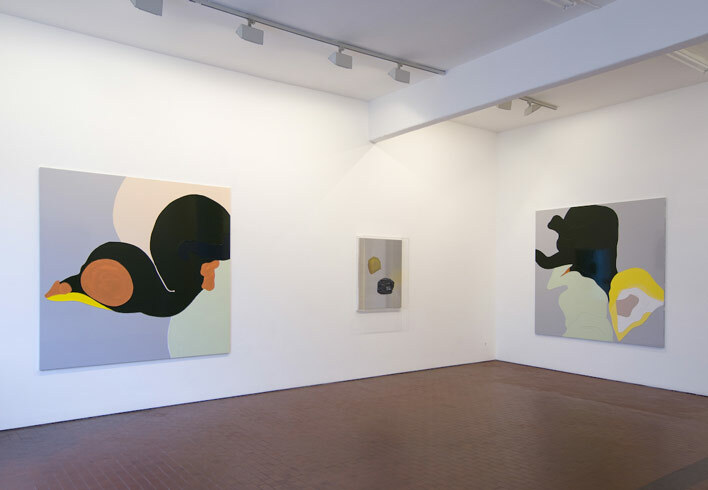 Galleria Lorcan O’Neill Roma is pleased to present its first solo show of British artist Gary Hume. The exhibition will remain open through the end of April 2009. In Baby Birds and Things That Are Left Behind, Hume presents a selection of his most recent works. The three largest pieces in the show are paintings of baby birds, composed in Hume’s characteristic medium of colorful household gloss on aluminum panels. Mediating between the figurative and abstract, these works depict newly hatched birds that the artist observed in a nest near his house. In examining these small, intriguing creatures, Hume asks us to reflect on the themes of vulnerability and innocence as embodied by fragile yet determined, ugly yet beautiful beings such as these. The three “Baby Birds” are exhibited along with their nests, represented in four new works that are sculptural in nature, and have strong ties in traditions to Italian art. These, too, are composed of aluminum panels, left bare except for the sections of black plastic, which Hume has rolled back to create the nest-like forms. Hume explains that this plastic is actually “the protective layer that covers aluminum panels. They always come like this, then you take it off and prime the panel. I’ve rolled it back and screwed it up. In a way all of my paintings are composed of skins, so with these pictures I’m just using the first layer of skin that comes with the painting”. In the show, all of his new works display Hume’s interest in surfaces, which complements his interest in volumes, or “that which is behind”, as he says. The true depth of this statement lies in its connection to Hume’s perception of life: that one can discover the essence of things in the layers of each painting, in that which lies below the surface. Gary Hume was still in art school when he spied a hospital door in an advertisement, and started the series of door paintings for which he first received recognition. The works were created using the same glossy household paint he uses in this exhibition. From that point on, the artist continued to work with real images that came from varied realms such as that of nature, the world of advertising, and the realities of everyday life. In Italy, his collection of works called Water series was on display at the 1999 Venice Biennale.